Evisceration troughs are used in manual poultry evisceration lines and are designed for transporting the evisceration offal. The evisceration trough is made of stainless, acid-resistant materials. 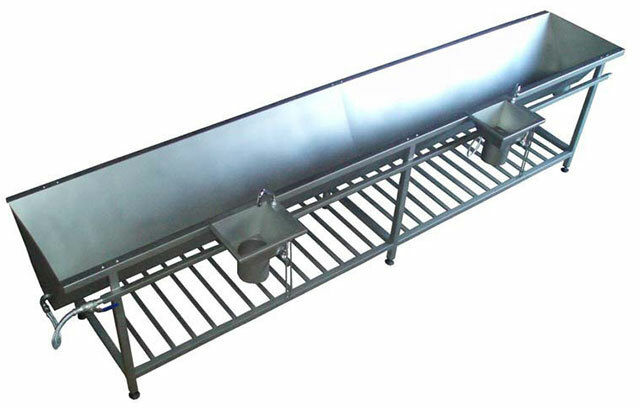 The length and width of the trough is adapted to the size and quantity of processed poultry. Depending on the width, working stands can be placed on one or both sides of the trough. On the rim of the trough, there are tables for tools and water valves with 10-second time-lag switches which ensure economical water usage. NOTICE: Trough height should be adjusted to the height of the overhead conveyor and platforms on the working stands. Height adjustment is possible in the range between 500 and 1,100 mm.